Coverage: Live commentary on BBC Radio Wales & Radio Cymru DAB south west Wales, plus live text commentary on the BBC Sport website and app. Swansea City manager Graham Potter believes his rising stars have given the club a new resilience following relegation from the Premier League. Potter has blooded a host of youngsters this season thanks in part to an exodus of senior players. His new-look team have come back to win games in which they have fallen behind five times in 2018-19. "Young players don't know when they're beaten. They believe in themselves - there's a spirit there," Potter said. "The players get each other through tough moments. "There are times when it won't go your way in football. It's not about how you do when you are playing well, it's about how you react when things aren't going your way. "The ability to stick in games and to grind it out and be resilient - they are fantastic qualities to have." 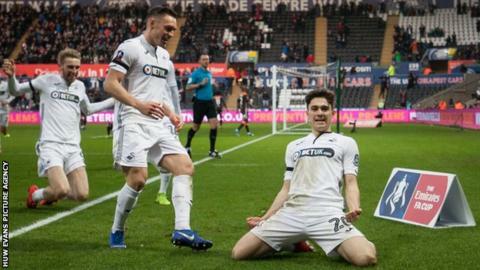 Swansea's most recent comeback triumph was in the FA Cup against Brentford last weekend, when they trailed 1-0 at the break but finished as 4-1 winners. They have come from behind four times to take maximum points in the Championship this season, away at Sheffield United and Millwall and against Blackburn Rovers and Sheffield Wednesday at the Liberty Stadium. Swansea have also fought back to draw with Wigan Athletic and Birmingham City. "We have been able to do it a few times and it's a good quality to have," Potter added. "In football you'll have times where you'll suffer. To turn any game around is not so easy, but the one thing you can't doubt is their desire and their attitude towards each other and the team. "They're a good bunch and they try their best no matter what people say about their quality. "That's one of the things we spoke about at the start of the season. We wanted to put a team out that people were proud of and who wanted to play for Swansea City. "Whilst you have got that feeling, you can always turn a game around." Potter, meantime, says "there is a chance" Kristoffer Nordfeldt will retain his place in goal when Swansea go to Sheffield Wednesday on Saturday. The Sweden player has been playing back-up to Erwin Mulder since early November, but was picked for the Brentford cup tie. "Kris has been working away well," Potter said. "Erwin's played a lot of games and it was the right time for Kris to have a chance." For the latest Welsh sports news follow @BBCSportWales on Twitter.